Tourism Australia’s specialist unit, Business Events Australia, will highlight Australia’s strengths as an incentive and association destination at IMEX Frankfurt, one of the world’s key business events exhibitions for international business events planners and decision makers. Joining Business Events Australia are 17 partners on the Australia stand, who will meet influential buyers responsible for organising corporate meetings, incentive travel programs and association events. “To get even more value for Australia at IMEX Frankfurt, we also sponsor events such as the Association Leadership Breakfast, providing access to key decision-makers from associations across Europe,” said Mr O’Sullivan. Partners on the Australia stand include convention bureaux, convention centres, accommodation and service providers. 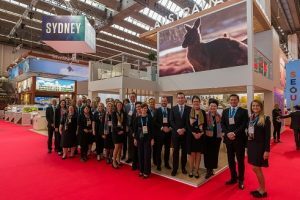 IMEX Frankfurt marks the first major international business events exhibition since the launch of Tourism Australia’s Boosting Business Events Bid Fund Program, (BFP) making AUD 12 million available over the next three years to secure new international business events for Australia. “With Australia’s track record in business events delivery and our winning combination of unique natural landscapes and friendly welcoming people we are already on the radar as the ideal business events destination,” said Mr O’Sullivan. “The BFP will provide even more reasons to choose Australia”. Business Events Australia will also launch the latest edition of ‘Australia Innovates’ at IMEX Frankfurt, a bi-annual magazine for the association sector that features some of Australia’s brightest people excelling in their field of expertise.